The Environmental Department was formally established in 2010 and currently has three staff. Our rohe is rich with resources and cultural history. 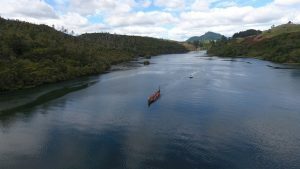 The Waikato River Settlement legislation has given our iwi the legislative forum needed to participate in a Co-management framework for the Waikato River. Because the Runanga is formally recognised as the iwi authority, the Environment Department actively participates and represents the iwi in all Resource Management Act 1991 decisions (at differing levels) as well as having a key role in a range of other legislative processes with various agencies. We also seek and implement projects that will protect and enhance our resources or further advance our understanding and participation in policy making decisions. The Ngati Tahu-Ngati Whaoa Iwi Environmental Plan provides the overall framework and direction for work within the Environmental Department. The plan was developed in conjunction with iwi members over 2 years. The process involved many hui with marae, iwi, kaumatua and others. The plan was released in November 2013. 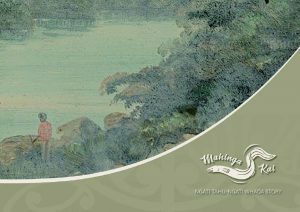 The Iwi Environmental Plan takes the name “Rising above the mist – Te Aranga Ake i te Taimahatanga”. Soft mists have always been a feature of our rohe, arising from the Waikato River and the rich wetlands that naturally occurred throughout our tribal lands. Our mountain ranges break through these mists and afford us a clear vantage point from which to see where we have been and where we might go to next. “Rising above the mist” infers that by working together, we may surmount any confusion or trouble that we may find ourselves in a the present time, obtain an expansive view of our terrain and chart our way forward to a bright and prosperous future. The plan is currently being reviewed and updated. This update will be completed by the end of 2018 and will involve additional wananga and opportunity for input from iwi members. The Environment Department is involved in application of some key areas of legislation and the aspects of this legislation that relate to the environment. This representation is through development of Joint Management Agreements and Accords with local, regional and central government agencies which enable Ngati Tahu-Ngati Whaoa as mana whenua and kaitiakitanga. To assist in achieving Te Ture Whaimana o Te Awa o Waikato, the Waikato Regional Plan for the Waikato catchment has been reviewed. The Runanga has been involved in the plan review and will continue to play a role in it’s implementation within our rohe. One of the key areas of focus for the Environment Department over the last 3 years has been in relation to Mahinga kai. In 2015 we undertook an extensive review of historic and contemporary information in relation to several key fish species in our rohe. We gathered Ngati Tahu-Ngati Whaoa matauranga as well as European information and western science. This report provides the information we need to be able to chart a way forward and focus on where we can achieve the best outcomes for our people in relation to mahinga kai. 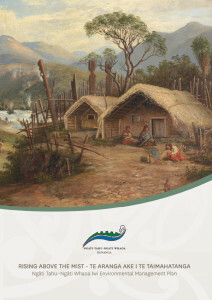 We have also been working with within the Nga Tohu o Te Taiao project over the last two years. The project is a four-year multi-institute collaboration led by the University of Waikato (UOW) in partnership with Waikato-Tainui College for Research and Development (WTCRD), Universities (Waikato, Massey), Crown Research Institutes (Landcare Research, NIWA), Waikato Regional Council (WRC) and Ngati Tahu Ngati Whaoa (NTNW) Runanga Trust. The Nga Tohu o Te Taiao (NToTT) project aims to develop knowledge, tools and processes for setting freshwater limits for mahinga kai within the National Objectives Framework, and aims to explore the extent to which mahinga kai represents a key proxy for the state of, and pressures on, freshwater catchments and how synergising matauranga Maori and contemporary science can enhance credibility and acceptability of limit setting to sustain mahinga kai objectives. 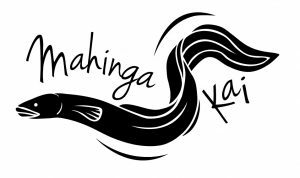 Following on from the initial Nga Tohu o te Taiao project, this mahi has extended out to enable the development of a specific Ngati Tahu-Ngati Whaoa framework to assess the health of our Mahinga kai sites. This work was undertaken with Landcare Research and NIWA. This assessment also fits within the National objectives framework. You can find out more about this tool by downloading the project outline and a summary pamphlet. The Environment Department is the key contact point for all resource consent applications and processes in the rohe. We are also responsible for reviewing all permits for use on land administered by the Crown and for a range of other legislative requests in the rohe relating to resource use. We provide review and input into these applications and processes to ensure the resources of the rohe are used sustainably and that the values of Ngati Tahu-Ngati Whaoa are upheld and protected. “To establish good working relationships with others where the mana of each party is respected and the role of Ngati Tahu-Ngati Whaoa in terms of kaitiakitanga, rangatiratanga and mana whakahaere is upheld and enacted”. We work hard to ensure we incorporate this approach within all our mahi.